Thursday’s World Cup action wraps up the group stage of the tournament before the round of 16 begins Saturday. The early matches are Senegal-Colombia and Japan-Poland in Group H, followed by England-Belgium and Panama-Tunisia in Group G.
Public bettors feel very confident in Colombia after their strong showing against Poland, and 73% of tickets have come in on Los Cafeteros to get another win against Senegal. They likely need a victory to advance, while Senegal just need a draw. Despite the lopsided action, the line has only risen from -109 to -114, so sportsbooks haven’t been too fazed. Senegal have also looked good through two matches and are setting up to be a worthy contrarian play to get a win (+362) or draw (+269). Bettors are forecasting goals, with three out of every four bets on the over (2.5). Before the tournament, few would have predicted Japan to be favored in this matchup. They’re tied at the top of the group and will advance with a win or draw, and could even make it through with a loss. Oddsmakers list Japan at +164 to get the win, and that’s where 47% of bettors are putting their money. 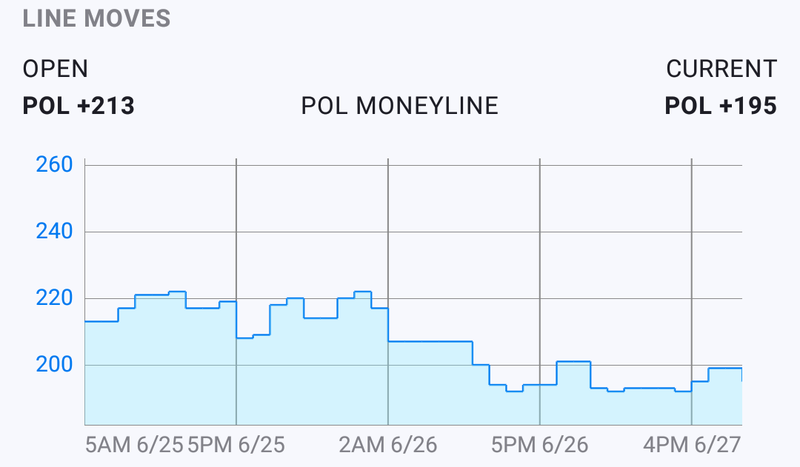 The market has reacted to the 41% of tickets on Poland, though. There are just 12% of tickets on the draw (+225), which could be a good angle to take considering how even these teams are. The majority of bettors (79%) are hoping to see the total go over 2.5 goals. Panama and Tunisia have already been eliminated, but both will still be playing for pride and for a win to close out the tournament. Tunisia are the odds-on favorites (-115) and are attracting 63% of moneyline bets and 65% spread bets. Odds have shifted in Panama’s favor since opening, signaling a bit of reverse line movement on the upset. Bettors are just about 50/50 on the total of 2.5 goals, but the sharper money has been placed on the over. It’s probably beneficial for both clubs to play for runners-up in the group since half of the tournament bracket is so stacked already (Argentina-France, Uruguay-Portugal, Brazil-Mexico). The other side, which the second place finisher would enter, consists of Spain-Russia, Croatia-Denmark and Sweden-Switzerland. Just over half of the wagers are on Belgium (+216) to win, with just 26% on England (+168) and 22% on the draw (+203). It’s a difficult match to bet on since the teams’ intentions are unclear. Over/under bettors are also split on this total of 2.5 (u-135), even though both teams have been scoring at will.